Kairros provides professional advice on a range of health management and re-employment issues for employers, insurers and clients. 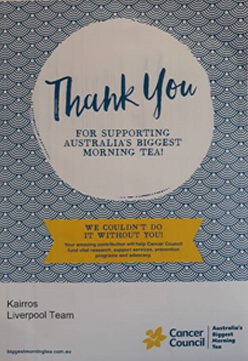 The Liverpool team at Kairros, in conjunction with atWork Australia, hosted Australia’s Biggest Morning Tea in the Liverpool office on 24 May 2018. Staff generously baked a selection of cakes, slices and scones and enjoyed a cup of tea to raise vital money for the Cancer Council. “STEPTEMBER” IS OFF AND RUNNING! Now meeting your needs 24 hours a day with Night Network Services!